Below you’ll find how to shop, returns & shipping information. We want you to have the perfect fit so before you shop, check out our sizing charts. From slim to regular or junior to half, we have all the varieties you need to make sure your presentation is at its best. Click here for step-by-step instructions with screen shots on How To Shop. Create an account by selecting the “Login/Register” button in the upper right hand corner of the home page. Fill out the appropriate billing and shipping information in your account. Click on the “Add Your School” button. From there, enter in your school name in the “School Search” section. Once you find your school, select the “+” button. Once your school is added, the “>” button will appear and take you to your school’s uniform page. Products are divided into two sections: Girls or Boys. Select the gender and grade you are shopping for and your uniforms will populate onto your screen. Select the product you wish to purchase. Use the drop down arrow to find your size and adjust your quantity. Then click the “Add To Cart” button to add this item to your cart. Use the “Continue Shopping” button to continue shopping. When you are ready to check out, click on the shopping cart icon in the upper right hand corner. Verify the items in your cart. Select which Shipping Method suits your needs, then select “Proceed to Checkout” button. Enter in your credit card information and then select “Place Order” button. Your order is now complete. Refer to your email for a confirmation of your uniform order. Please allow 2-3 business days for your order to be processed. • Money order or Classic Designs Scrip Card must be provided at time of purchase. You are not able to use this method of payment for online purchases. Why am I getting an “Error” message while trying to log in? After a number of unsuccessful log in attempts, our website’s security will automatically lock your account for 5 minutes. After those five minutes have passed, you can then try again, or go through our “Forgot Password” link. Merchandise may be returned with an original receipt for exchange or refund within 90 days of purchase. Item(s) must be unused with the price tag attached and in its original package and condition. Please refer to the Return Policy section below for more details. Orders submitted and to be delivered to the schools are free of shipping charges. Please refer to the Shipping section below for the designated delivery schedule dates. These are the only dates available for free shipping. If you wish to have a different date for shipping, we have ‘Ship to You’ shipping available with the applicable fees in the same Shipping link. Looking for a New School Uniform provider? Any referrals or queries from schools on becoming a client of Classic Designs are always welcomed! Please email us at [email protected] or call us at (415) 661-4700, and a representative will follow up with you promptly. Classic Designs provides free delivery to certain schools throughout the school year! If your school offers school delivery, the coupon code will be located in the second item slot after you go through our school search and select your child’s gender and grade. Please place your order by 3pm on the “Order By Date” to ensure delivery on the “Delivery Date”. 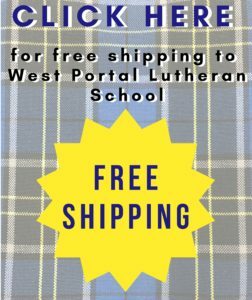 Look for the symbol below among your school’s items for instructions on how to enter the free shipping code! Classic Designs can ship merchandise directly to your address through UPS or US Postal. Please allow 5-7 business days for shipping. Picking up at our store location (1551 Taraval Street, San Francisco CA 94116) is always FREE. Call ahead or order online and we will have your items packaged and ready for pick-up within 2-3 business days. Can’t find parking? Not to worry. Call us and we can bring your prepaid package to your car. Merchandise may be returned with an original receipt for exchange or refund within 90 days of purchase. Item(s) must be unused with the all original tags attached and in its original package and condition. If you plan to return merchandise to the school office to ship back to Classic Designs , a PRE-AUTHORIZATION IS REQUIRED. Please call Classic Designs to receive authorization PRIOR TO DROPPING OFF ITEM(S) AT SCHOOL. Item(s) will not be processed without pre-authorization. Any returns that total to less than $5 owed to the customer will be returned to that customer’s account in the form of store credit. Store credit can be applied to all in-store or phone orders. For school delivery dates that fall on the week of Easter vacation, we will be shipping the items on Friday while the school is closed, to be received on the following Monday. The school deliveries will be available to pick up in the school’s office on the Monday following Easter vacation.